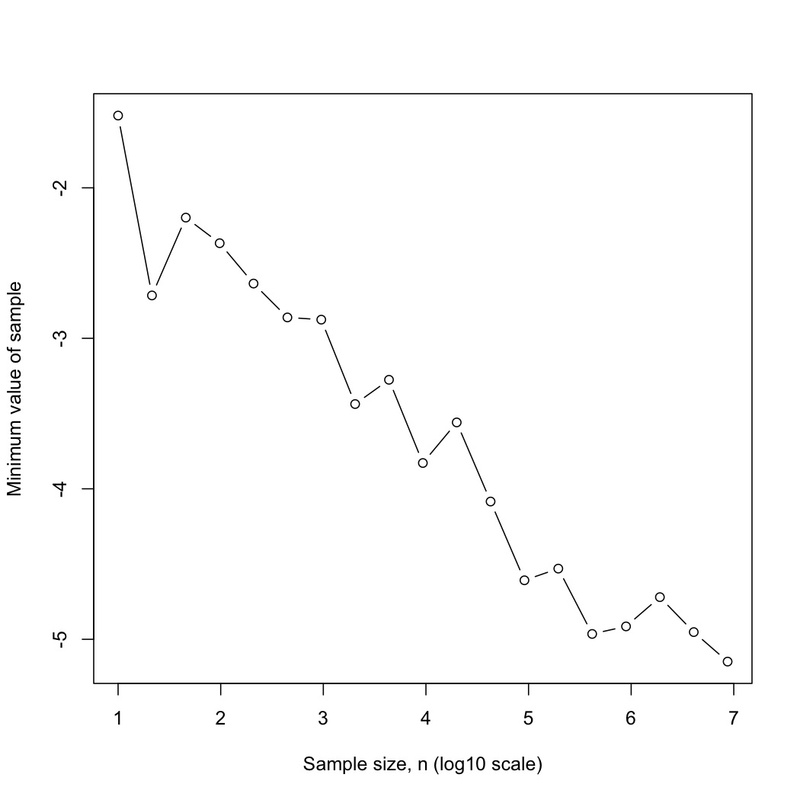 p-value.info: On the unreasonable effectiveness of data: why are more data better? On the unreasonable effectiveness of data: why are more data better? Update 11/30/14: I incorrectly named the authors of the "unreasonable effectiveness study, now corrected. "simple models and a lot of data trump more elaborate models based on less data". In that paper and the more detailed tech talk given by Norvig, they demonstrate that when corpora get to hundreds of millions or trillions of training sample or words, very simple models with basic independence assumptions can outperform more complex models such as those based on carefully-crafted ontologies with smaller data. However, they provided relatively little explanation as to why more data are better. In this post, I want to attempt to think through that. I propose that there are several classes of problems and reasons for why more data are better. and described it as a "data threshold" in which results went from really bad to really good. I'm not convinced that there is any threshold or anything that resembles a phase transition. This seems to me to be a problem of finding the closest match. 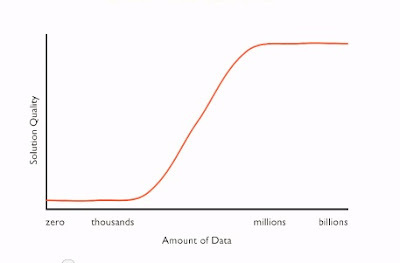 The more data, the closer the expected match. There is a large difference in those corpus sizes and a "qualitative leap" is not the same as a threshold (sensu phase transition). The minimum decreases loglinearly. This is a case of extrema from an unbounded tail. Perhaps more relevantly, here, for a minimization problem such as scene matching there is a lower bound: for all intents and purposes, a perfect match. For instance, perhaps someone else stood in the same exact tourist spot and took a picture of the exact same scene but without the obstructing car. I think this is what is happening in Norvig's schematic. At a certain corpus size we've found a really good match and a larger corpus doesn't and cannot improve results. In summary, for nearest neighbor type minimization problems with a non-negative distance function (meaning that the cost function has a lower bound of zero), that distance function will, on average, decrease monotonically with data or sample size. Pr(che,apdeals,andstuff) = Pr(che) * Pr(apdeals) * Pr(andstuff). Pr(cheap,deals,and,stuff) = Pr(cheap) * Pr(deals) * Pr(and) * Pr(stuff). A second example that Norvig covered was spell checking. Here we can take a misspelled word and compute the likelihood of the possible variants to suggest the most likely form. the larger the corpus, the better the quality of the estimate of the relative frequency. This is the law of large numbers. the larger the corpus, the more likely it is to include unusual phrases, i.e. the long tail. This is an unbounded effect. The more of the web is indexed, there will always be new, never-seen-before phrases. The problem is exacerbated in that the distribution of words in the english language is a power law. (e.g. Zipf, G. The Psycho-Biology of Language. Houghton Mifflin, Boston, MA, 1935.). This means that the tail is especially long and thus especially large samples are needed to capture those rare phrases. A third class are estimating univariate distribution problems. I recently encountered an interesting example while attending a tech talk from Peter Skomoroch from LinkedIn. 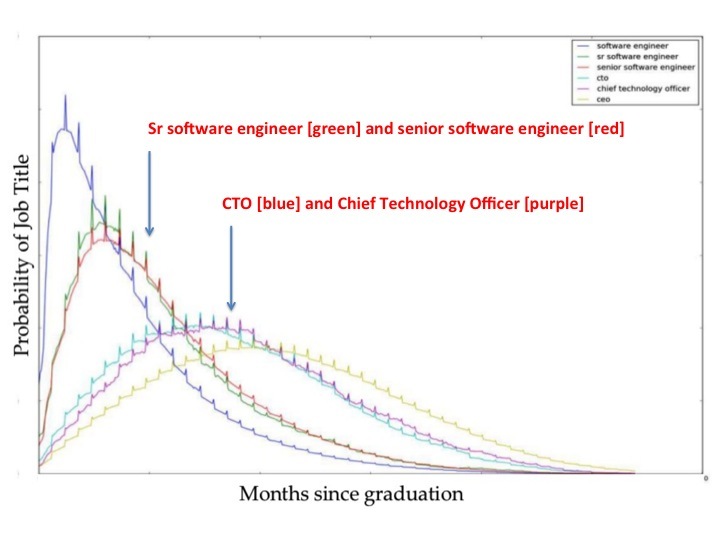 He showed a plot of likelihood of a member having particular software-related job titles versus number of months since graduation. What we see from the data is that the distributions of "Sr Software engineer" and "senior software engineer" are almost identical, as one would expect as they are synonyms, as are "CTO" and "chief technology officer". This then presents an interesting way of identifying synonyms and so deduping the data rather than maintaing a huge master list of acronyms and abbreviations. This is only possible because of the scale of data that they have where the distribution they can generate is reliable and presumably close to the true underlying population distribution. At left is a small sample. It could easily be interpreted as linear. 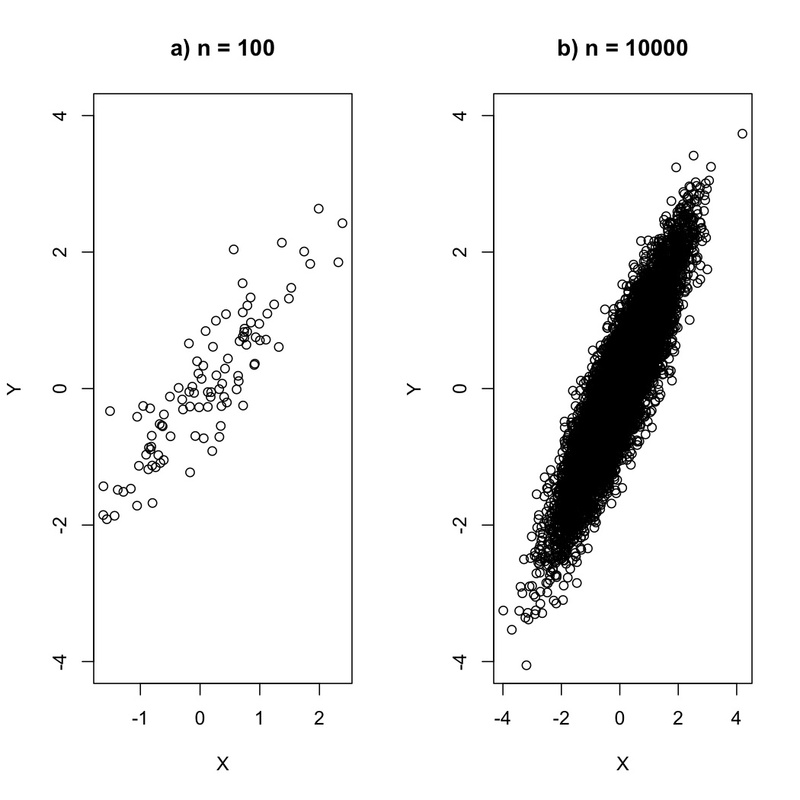 At right, with a larger sample, the true underlying bivariate normal is more obvious. Clearly, this is a trivial example. 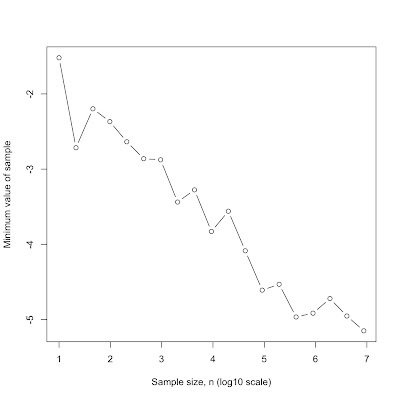 The point is that for higher dimensions you will much larger sample sizes to estimate the joint pdfs well. This is clearly a cursory answer as to why more data are better. Quality data are still preferred. 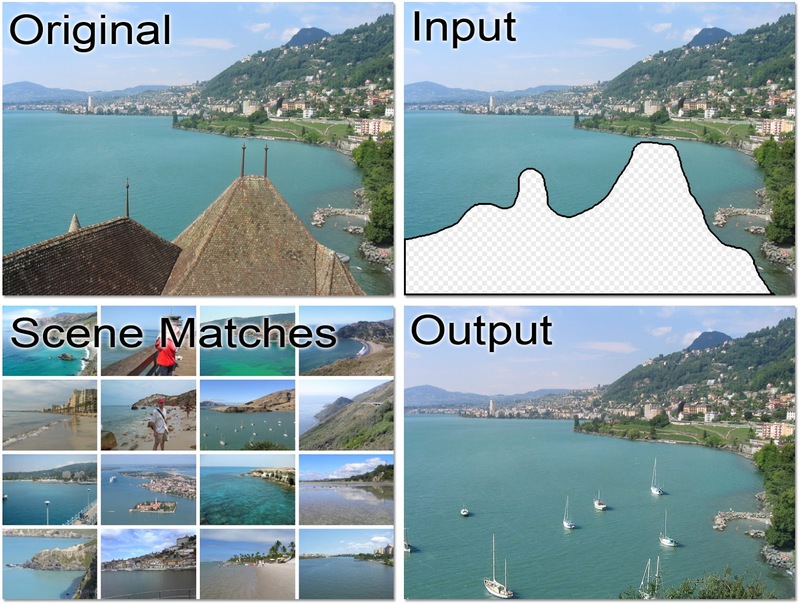 However, for many organizations, such as Google, Twitter, LinkedIn and Facebook where content is user-generated, is often free-form text and/or covers many domains (and so deep-cleaning and the use of ontologies is infeasible) then what we see that having very large datasets can compensate for the noise. It all evens out in the end and in the case of nearest neighbor problems, the solution will always be better.